Ameriprise Financial (AMP) has one of the juiciest yields in the markets these days, but most investors don't even know it. How could a company with a nearly $12B market cap have a large yield without the market realizing it? Maybe it goes back to Ameriprise Financial splitting from American Express (AXP) several years ago. Combine the split with the financial crisis and maybe most investors don't know or trust what appears to be a new name in the financial world. After all, American Express has much lower yields and forecasted growth rates, so investors appear to trust the old parent more. The other culprit is that investors remain completely focused on the dividend yield while ignoring the buyback yield or even more importantly, the earnings yield. Disclosure: No position, but might initiate a position in AMP this week. Please read the disclaimer page for more details. Quick name the retail brand that had the fastest growth rate in March? Bet not many people come up with kate spade. For March, kate had a 73% comp growth rate. Now don't officially quote the fastest part since I don't have access to any database of all brands around the world to confirm. Though seriously doubt that any major brand with over $50M in quarterly sales is growing that fast. The growth rate of kate spade is what makes the debate about the value of Liz Claiborne (LIZ) such a heated conversation. Too many investors look at the total numbers for the company reported this morning and it doesn't really impress. Technically Liz reported no growth and basically flat EBITDA. Why would such a company be worth $2B as suggested by numerous articles speculating on buyout offers? With the dramatic fall in domestic natural gas prices during 2012, the results of the domestic oilfield services firms have been increasingly scrutinized. The performances have been mixed and the results have been very location specific as expected. The stocks have all headed lower. The key is location, location, location. While the stock market has obsessed daily about the natural gas market in the US, just about every other market whether oil or natural gas around the world is very robust. This provides plenty of opportunity for the best positioned stocks that have been sold off with no regard to location. Oddly the bets on a negative Apple (AAPL) quarter were off the charts prior to the release. Every other person on the street suggested that the weak numbers from AT&T (T) and Verizon Wireless (VZ) were signs of impending doom for AAPL. The executives must get a chuckle out of all the non-sense that exists in the media. AAPL reported earnings of $12.30 versus the estimate of $10.06. Yes you read that correctly. Though analysts were rampantly debating whether AAPL would miss estimates, the company actually beat numbers by over 20%. Will SodaStream's First Report In U.S. Dollars Be The Catalyst For Gains? Back on February 29th, SodaStream (SODA) announced Q411 results and provided a little nugget that apparently the whole market missed. The company announced a change to reporting in the U.S. currency (USD) effective January 1st, 2012. Anybody following this company has known that it has reported in euros (EUR) and provided a translation to the USD. This is common of foreign companies. The odd part though is that popular finance websites such as Yahoo Finance (see below Figure 1), Reuters, and probably most others continue to report the analyst estimates in euros. What Action To Take When Your Stock Plunges After Hours? Its always a bad situation to have a stock that plunges after hours. Do you panic and sell immediately? Do you hold and hope for a rebound? Or do you read the earnings report, listen to the conference call, and use your past research and knowledge on the stock to make an educated decision? Honestly, it really depends on what the company says compared to expectations. Knowing the company and the stock is the key. The stock reaction can have nothing to do with the company. It might be a buying opportunity. Or if the story has changed, investors have to be willing to cut and run. After the bell tonight, Riverbed Technology (RVBD)reported Q112 numbers that were essentially in-line. Unfortunately, the company guided to Q212 numbers that were a major disappointment to the market. The stock plunged nearly 18% in after hours. Was this move justified? Is the valuation so stretched that bad numbers suggest the stock should plunge? The reason for the cut was an anemic GDP print in Q4 of only 0.3%. Inflation has also dropped with expectations now at only 4.4% for 2012. This could provide cover for even more cuts this year. Amazingly, the interest rate could fall below levels last hit in July 2009 of 8.75%. Even possibly lower. Heck, I'm not sure I understand why Brazil has such a insanely high rate. It doesn't have GDP growth faster than China or India so why are interest rates higher? Anyway, guess that is besides the point. This model lost a disappointing 5.8% in March versus a 3.1% gain for the benchmark S&P 500. This model typical outpaces the major indices by a large margin in up periods so the last month was a major exception. Big news lately on the LNG export front. Yesterday Cheniere Energy Partners (CQP) got approval to begin construction on it's export terminal in Louisiana. Today Sempra Energysigned agreements with 2 major Japanese companies to develop and construct a natural gas liquefaction export facility in Louisiana as well. While another major step towards exporting the abundance of cheap natural gas in the US, it will take until 2016 before the facility would commence operations. With these 2 commercial agreements with Mitsubishi Corporation and Mitsui & Co., the project would already have 66% of production set for 20 years. Now the question is whether the US government will ultimately allow the export of this natural resource. The answer so far is yes, but what happens in 2014 when the future prices for 2015 and beyond start soaring? After the close on Monday, Chesapeake Energy (CHK) filed for an IPO of its oilfield services division. Based on initial review of the S-1, Chesapeake Oilfield Services (COS) should be avoided at best if not shorted. Naturally this will highly depend on the ultimate valuation place on the stock once it prices and starts trading. Chesapeake intends to raise $862M in a much announced IPO of the oilfield services division that performs a big portion of the work for Chesapeake itself. The interesting part is that the sector is under pressure so a lot of investors will see this as a desperate move. Industry leader Haliburton (HAL) is around 52 week lows and last year's fracing IPO C&J Energy Services (CJES) trades near lows as well. Impressive stuff from 3D Systems (DDD). Watch the below video as the CEO showcases the new 3D home printer with Blomberg West. Definitely need to keep an eye on this stock along with Proto Labs (PRLB) that recently went public. This real time printing and creation of manufacturing products has the potential for huge growth. Right now though, 3D Systems trades at 24x forward earnings with only 15% long term earnings growth. Clearly for now the stock doesn't match the growth rate. The question is whether the company has created a product that will dramatically increase growth or whether this product is ultimately a novelty product. This is clearly worth more research. Maybe a weekend project. This model gained a solid 4.3% in March versus 3.1% for the benchmark S&P 500. The model remained strong all month even as the SP500 struggled toward the end of the month. Trade March was a normal trading month for this model with only 1 trade initiated in order to reduce the cash balance. Time Warner (TWX) was bought as the stock flashed one of the highest Net Payout Yields in the over $10B market cap group with a huge buyback. The stock also maintains a strong 2.9% dividend providing for that investor class as well. For more details on why Time Warner was selected, please read this article. Top Performers The largest gains came from Lowes (LOW), WellPoint (WLP), Gap (GPS), and Goldman Sachs (GS) along with several other stocks that had solid gains. Most of those stocks saw gains that exceeded 10%. On Wednesday night, 2 oil equipment companies priced IPOs. While solid companies in a booming oil and gas shale sector, neither has been hyped a lot by the IPO buzz network. For one, MRC Global (MRC) priced at the low end of the range at $21. Also on Wednesday, the Natural Gas spot price closed below $2 for the first time in 10 years. This is clearly not the ideal time to price an IPO for the energy sector. The other stock is Forum Energy (FET) that provides products and services for the oil sector. Neither stock has gotten much fanfare. For example, both companies have under 30 email alerts followers on Seeking Alpha, while Splunk (SPLK) already has 52 followers, yet it won't go public until next week. After recently writing articles (I, II) about mobile advertising, it seemed appropriate and interesting to check out the mobile payments industry next. With smartphones and tablets now widespread, the mobile payments industry appears ripe for major growth in the next 5 years. Normally being ahead of the curve on mobile adoption, I actually found myself very uninformed on mobile payments. Maybe the central part of the country is just behind on this technology adoption as I've yet to run across a small business owner using a mobile card reader. For now, the industry is very fragmented with numerous developments underway. Not to mention that concepts of whether mobile payments means the customer or the business uses the mobile device are mixed. Forget Hard Landing, Is China Already Re-accelerating? Over the last few months, the markets have been struggling with whether China was headed for a hard landing. The Shanghai Index ($SSEC) recently headed back to 3 year lows on these fears. 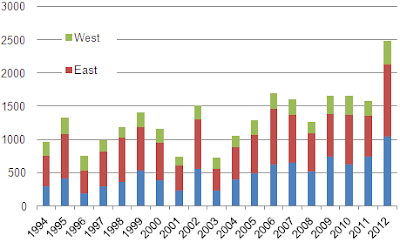 What though if China was already re-accelerating? Recent reports on bank lending and inflation suggest that the economy has already hit bottom. David Carbon, Managing Director of Economics and Currencies at DBS Bank, thinks China hit bottom prior to the start of 2012. Now with the inflation data picking up (March came in at 3.6% vs 3.3% for February) it signals the economy already turning around. Song Wun of CIMB Research thinks China could expand as much as 9% this year with a target of 8.7%. Remember that the government set an official target of 7.5% though any smart investor should've known this was the lowest possible. Instead, the market sank thinking a hard landing was on the way. Samsung Electronics reported a large increase in profits that easily beat analyst estimates. The largest Asian consumer-electronics maker beat estimates by selling more phones than even Apple (AAPL). Not that this is new to most investors, but Samsung has become a very formidable competitor in the smartphone market. Also, assuming Apple enters the TV market as expected both companies will go head to head in that market as well. The real question remains whether people are buying Samsung phones over an iPhone or as the best option available or for the price. Either way, it definitely shows where consumers are buying phones instead of Nokia (NOK) and Research in Motion (RIMM). Without doing much research, I'm assuming most of the gains come from Asian markets and not North America. With most of my friends owning iPhones, its difficult to assess the Galaxy as a true threat to the iPhone. Which company is a better investment at this point: Time Warner Cable (TWC) or Time Warner (TWX)? I bet most investors wonder if the answer isn't none of the above. From a high level, both stocks offer nearly 3% dividends, making the stocks attractive to a large swath of investors. What about for investors that want the 4%+ dividend yielders? Let's first review these two companies that split back in 2009. As we highlighted on our blog back in August 2009 [Apple to $1,000], the concept has been around for over 2 years now. Back then the rumor of a tablet was circulating and the Mac was expected to continue gaining share. Instead, the iPad has taken off and offers such great functionality that it has replaced a lot of the expected new demand for the Mac. Either way though, the concept of Apple (AAPL) gaining more share of the computer market has come to fruition. 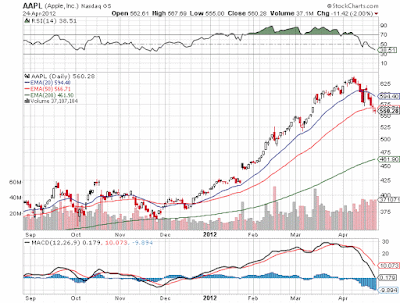 The news of the day was that analyst Brian White of Topeka Capital slapped a $1,001 price target on Apple. While this is the first official Wall Street analyst to place such a lofty target on the stock, he clearly wasn't the first mainstream analyst to shoot that high. Not to mention the big difference between suggesting that target with the stock at $140 in the midst of a financial crisis and saying it with the stock at $600 with the S&P500 at multi year highs. 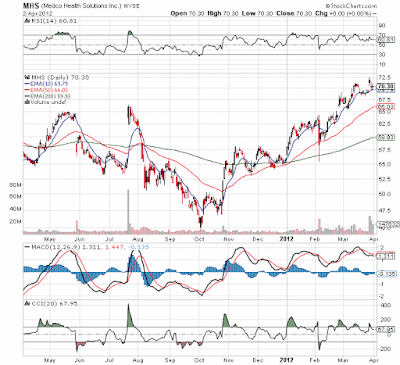 Finally the merger of Express Scripts (ESRX) and Medco Health (MHS)closed today. It took since last July to close the merger and any investors holding on this period had limited gains. See graph below nothing the Medco stock closed around $67 around the announcement and only recently reclaimed those levels. The WSJ reported around noon on Friday that Liz Claiborne (LIZ) has been in talks with private equity firms over a potential deal around $20 a share. Currently, it doesn't appear that any of the firms, such as KKR & Co (KKR), Permira or Warburg Pincus LLC, find that price appealing. Not to mention that the Liz management has denied any interest in selling the company. The news was enough to send the stock soaring. It closed at $13.36, up nearly 13% at a new 52-week high. At $20, Liz would have a value around $2B. Is that an appealing price for long investors? First, lets look back to the recent transformation of the company. Back in October, I wrote an article about the transformation of the company. 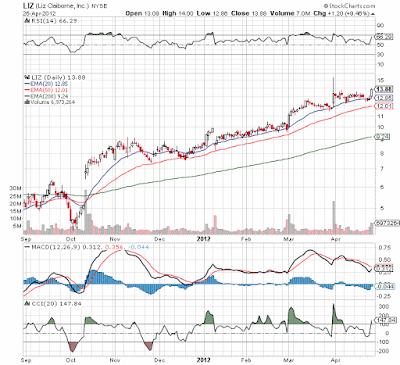 Just prior to that article, an investor could've bought Liz's stock in the $4s. Now the stock has tripled and a deal around $20 would've given an investor a 300% gain in less than six months.